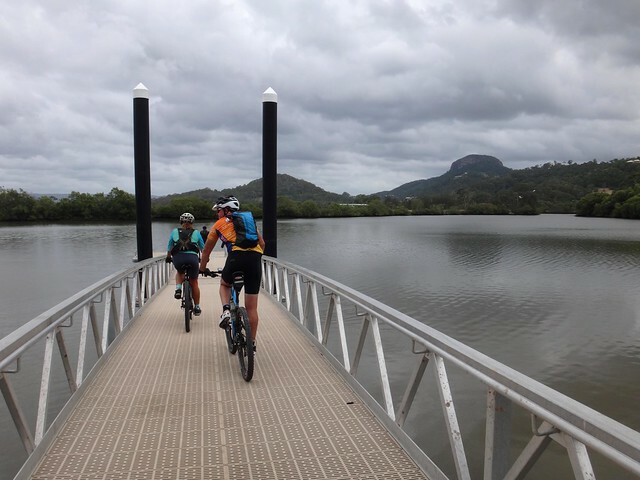 The serene Maroochy River meanders through sugar cane fields and mangroves as it wends its way from Yandina to Maroochyore on the coast. 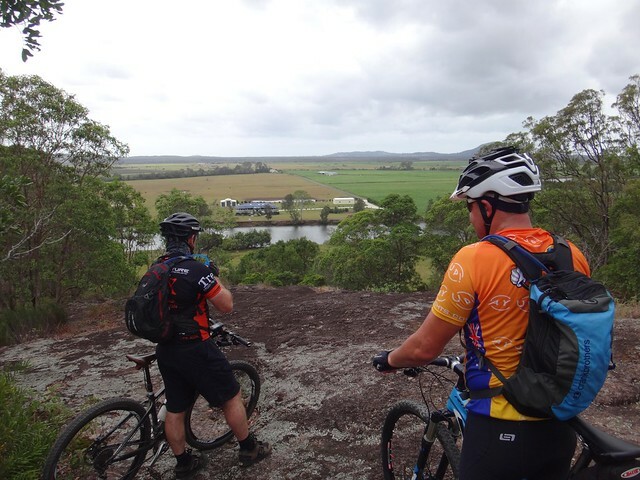 Today’s adventure took us from Parklands State Forest, near Nambour, to several interesting spots along the Maroochy River, and then finishing back in Parklands. I also wanted to have a look at different ways of getting from the river to Parklands as part of a future social ride where we may have to paddle across using Eric’s inflatable dinghy. 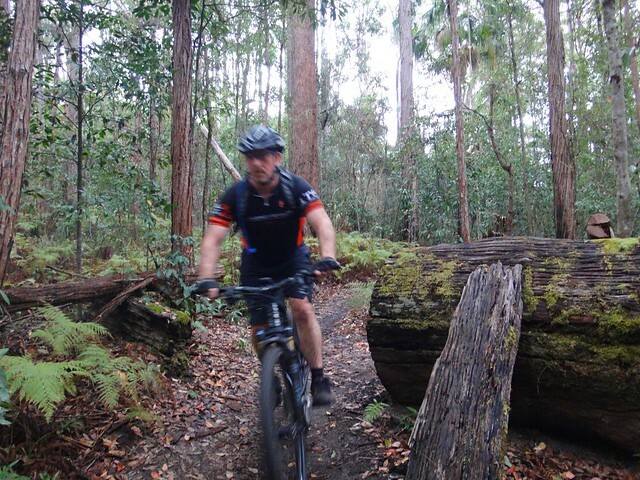 Clare and Kat from the Bushrangers Mountain Bike Club kindly offered to show Darb, Jason, Paul and me around the twisty trails at Parklands where it’s easy to get lost if you don’t know where you’re going. As it drops into the rainforest, the Road Rage track gets hilly, covered with slippery roots and rocks. In the high heat and humidity it was tough work. Road Rage Creek Crossing. Photos by Clare Burns. There’s one tricky W-shaped double creek crossing where you roll down and up through one creek to a peak before immediately rolling through the next crossing. I baulked in the middle, while Clare captured my lack of skills for posterity. 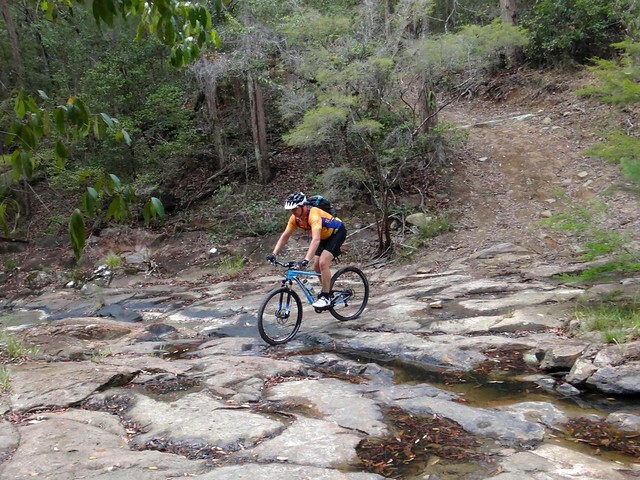 It was a lot of fun to ride over the rocks at Rocky Creek, although I don’t think it would be a good idea to try this crossing after a lot of rain. We exited the park here and made our way towards the river. While the road here is reasonably busy, we only had to endure it for a few minutes and a kilometre or so before reaching the river. 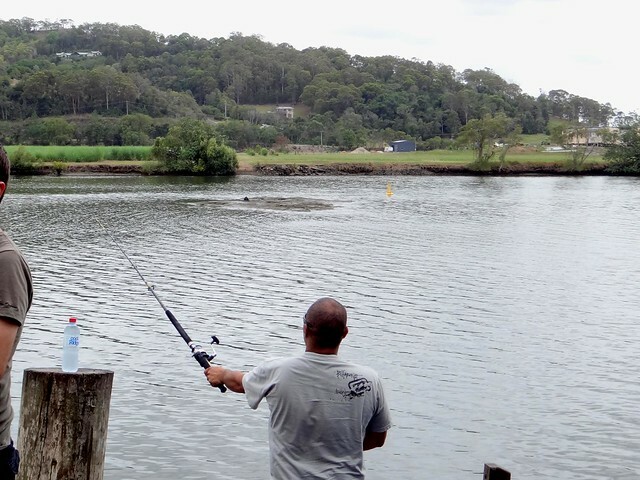 Lake Dunethin is a small inlet on the southern side of the Maroochy River. Popular with kayakers and anglers it has some great views of the surrounding scenery. “Is that Dunethin Rock?” someone asked pointing across the water. “No, that’s Mount Ninderry”, I said, recounting the aboriginal legend of the old man who was jealous of the love between the young man, Coolum, and his lover Maroochy. “So where’s Dunethin Rock?” we wondered, having seen some tourist signposts telling us about it as we rode in. “Is that it?”, a few of us wondered, pointing to a submerged reef in the middle of the river. I asked the fishermen, but they didn’t know. Atop Dunethin Rock we had a perfect vantage point for viewing the river, and the cane fields on the other side. 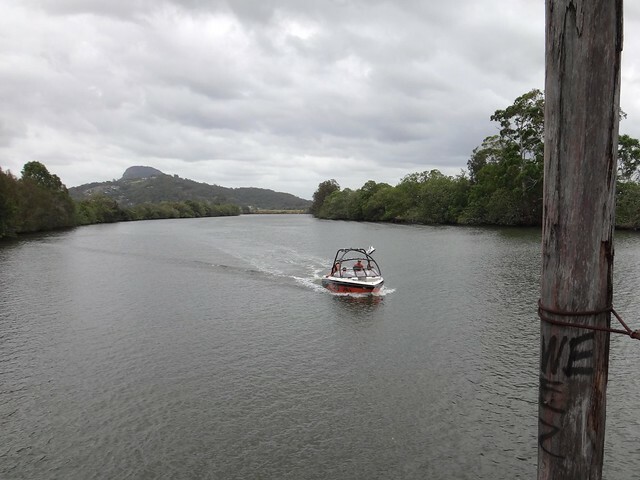 In the 1880’s steamships from Brisbane would paddle up the Maroochy River as far as Dunethin Rock. A decade or so later smaller mail boats plied the river carrying sugar cane to Dunethin Rock. A horse-drawn tram would then carry the cane to mills in nearby Nambour. 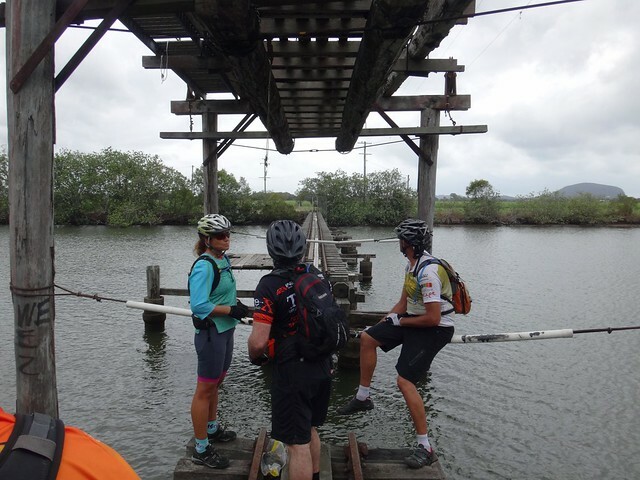 From Dunethin we pedaled a little further downstream through fields of sugar cane to the railway bridge. 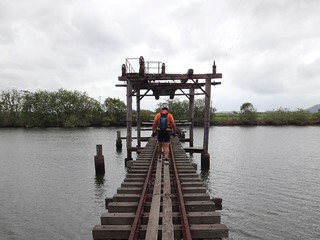 Not long ago, Simon and I had checked out the northern end of this bridge. It was interesting to have a look at the same bridge from the southern side, with its small gap part-way across preventing anyone from crossing over. 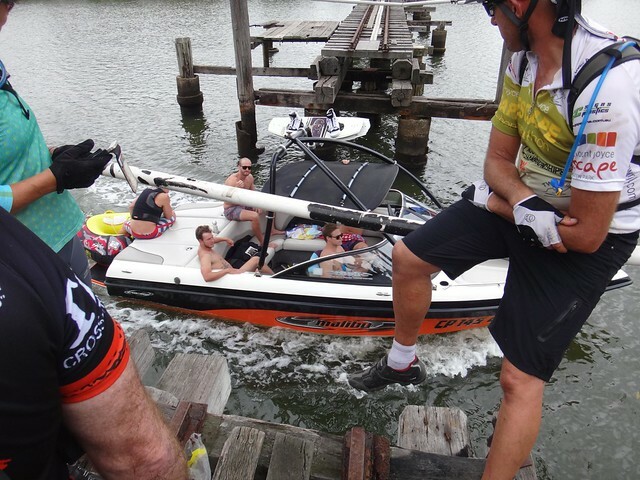 We all mused about how we might use an inflatable boat to get riders and bikes across. 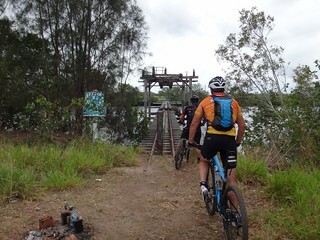 Darb suggested we just swim across, and swing the bikes over on a rope. Jason thought we could bring a ladder and either use it as a bridge or climb over the lift. (I was getting vertigo just thinking about some of these solutions). “You wouldn’t want to be floating in a dinghy when that went past you”, Paul advised. With all these ideas spinning in my head, I turned and started to edge off the bridge. It’s tricky in cycling shoes, and I admit I felt a bit uneasy stepping over railway sleepers with nothing but daylight underneath. Solving the river crossing problem could wait for another day. 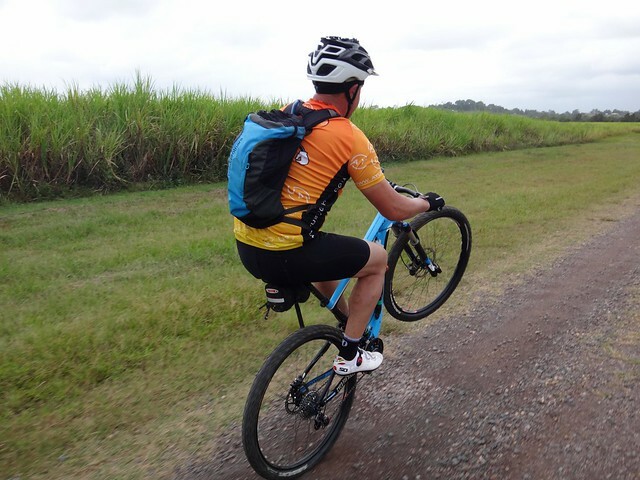 Pleasant dirt roads zigzag through endless cane fields in this part of the world. 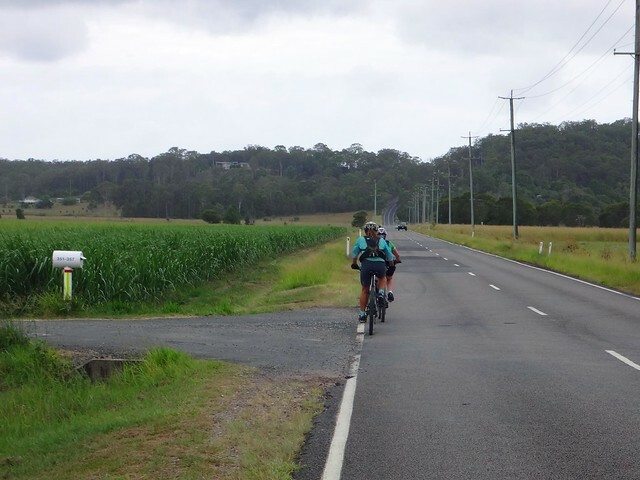 Before returning to the tough trails of Parklands, I wanted to “cruise” for a while, and asked if everyone wouldn’t mind a bit of a roll through the farmland next to the river. The conditions were perfect. Thick clouds gave us plenty of shade, while a stiff easterly sea breeze cooled us down. 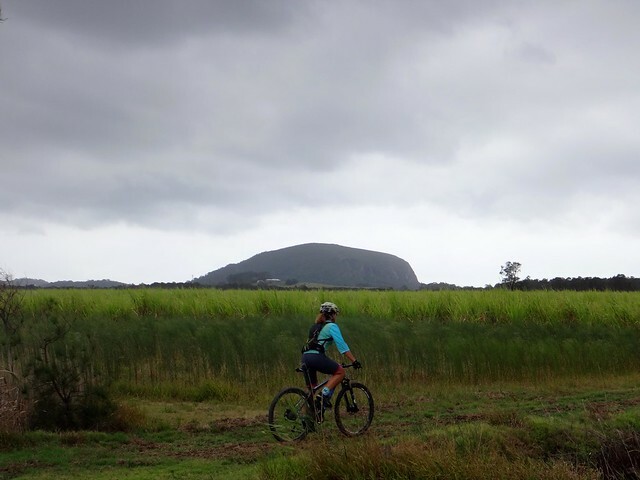 As we zigged and zagged along gravel roads, Mount Coolum peeked out from behind the waves of cane. When the road petered out into a faint grassy vehicle track, we just turned the bikes around and headed back the way we came. 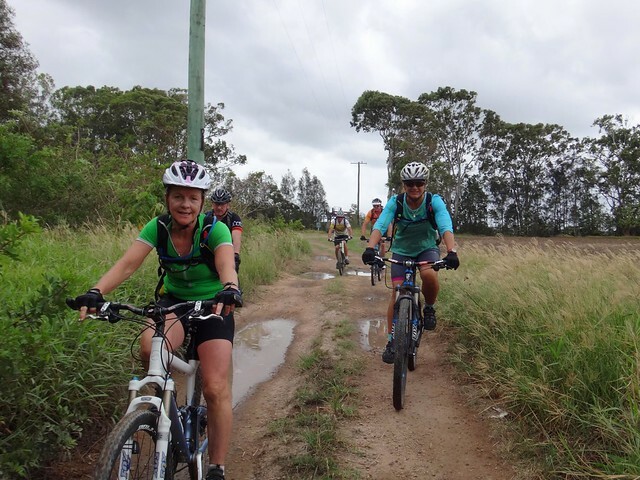 After a long slog up Camp Flat Road (which is anything but flat), and Atkinsons Road, we eventually made it back into Parklands. 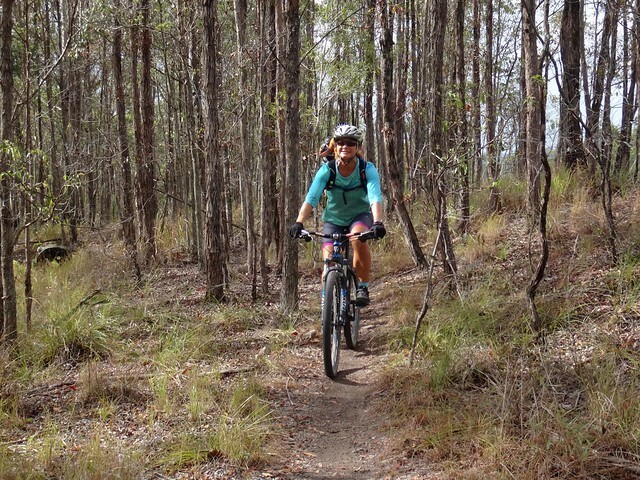 Clare led us down some beautiful fast flowing smooth single track with high berms which twisted and turned through the trees. 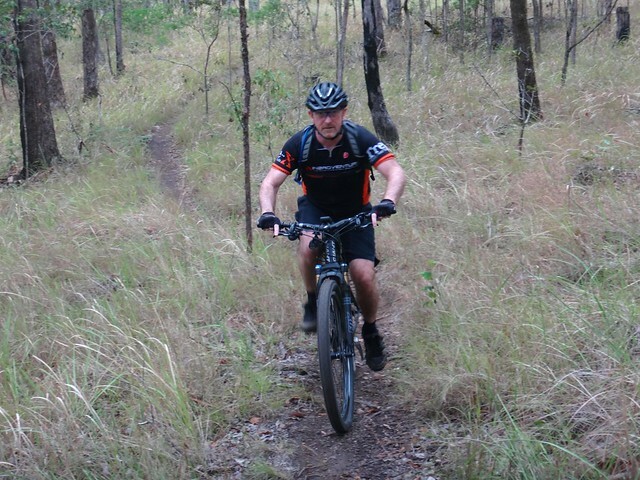 Single track riding is not one of my strengths so I quickly percolated back to my natural position at the rear of the pack while everyone else raced ahead. 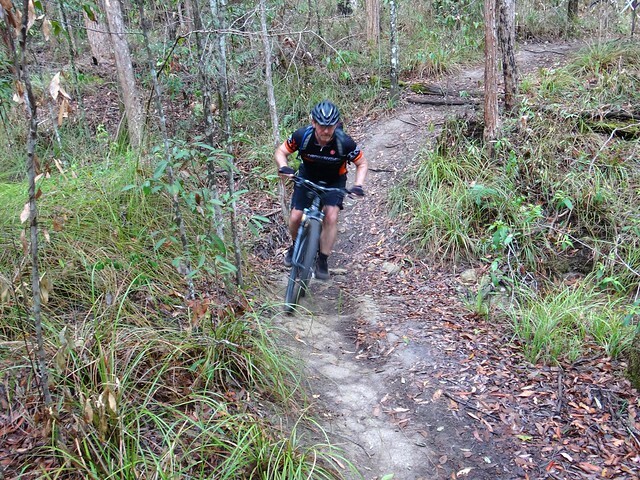 Some of the descents were tricky. Darb had a minor crash on one drop-off. His tyre lost air and slid out from under him at the wrong time. He suffered a few scratches and his bike copped a small amount of damage, but he was able to ride out. 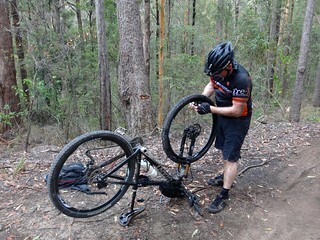 Earlier in the ride, Paul broke his chain, which gave me a chance to catch my breath and pester him with a few photos. As we snaked back to our starting point through “Ho Chi Ho” track, the rain that had been threatening to come all day finally fell. The light drizzle in the cool mossy forest was a perfect way to end the ride. I was surprised when I looked at the GPS and realized that during our five hours of riding I had burned 2,400 kcal, but had only covered 38km with 750m of ascent. 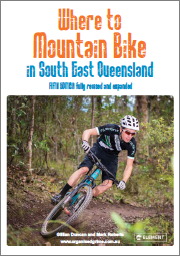 It seemed so much further – but that’s the thing with Parklands. 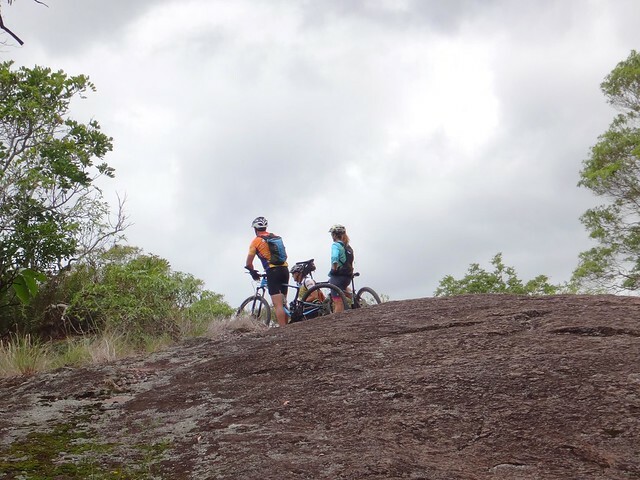 The hills and technical trails make any distance seem twice as far. I’d rate any multi-hour ride in Parklands 8 out of 10 on the tough-o-meter. Our pleasant roll by the river mitigated the effort and gave us time to relax, so at the end of the day I’d give this one 7.5 out of 10 on the tough-o-meter. In cooler less steamy months, maybe 7. Thanks Clare and Kat for showing us around your back yard. 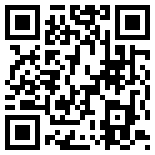 And thank you, Darb, Paul and Jason for sharing in this enjoyable adventure. 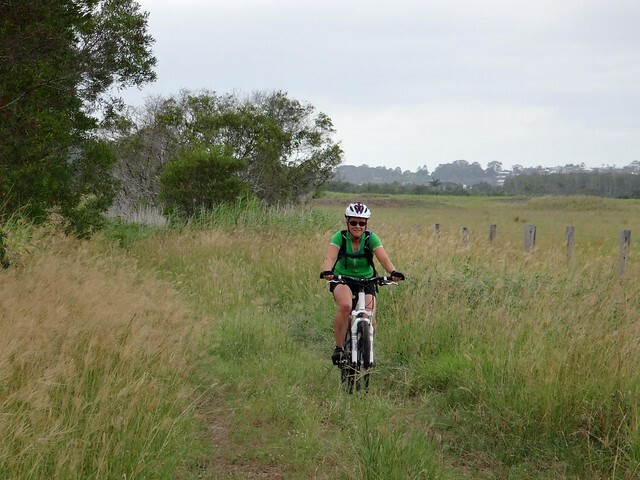 Parklands Maroochy River 2014-02-22 from Darb Ryan on Vimeo.